Initially was skeptical given my feeling towards many of Mel Gibson’s tendencies as a filmmaker, but thankfully were never too much of a bother in the case of Hacksaw Ridge. Some noted issues come into play but there’s another point to which they turn less bothersome and it’s at that point I wish that Hacksaw Ridge could have remained that way through and through. Thankfully, what Mel Gibson has serviced within this WWII biopic is indeed something worth spending time with but it never moves out without any qualms worth noting. Nevertheless, if Mel Gibson were set to direct another film in the near future, Hacksaw Ridge has also went on to solidify excitement for what is set to come. It’s got many of the best qualities of a good war film, and maybe at that point that was all it needed to carry. Andrew Garfield plays Pacifist Desmond Doss, as we are told his story of how he became the only conscientious objector to have earned a Medal of Honor during WWII. Through Hacksaw Ridge, we gain a picture of him through his experiences before the war and the moment he started saving the lives of many who were fighting in Okinawa – which even include his own religious consciousness and his romantic affair with nurse Dorothy Schutte. It’s clear already from the way Mel Gibson starts Hacksaw Ridge that he intends for a more meaningful character study especially with how we get a closer look at what formed Doss’s decisions to become the man whom he was during the war, but at the same time there’s a point to which it also comes out lacking the impact it intended to carry. While not particularly terrible, it can already be felt that Gibson’s intentions with the romance between Doss and Schutte are well-put, if also out of place. Once in a while, their exchanges can come off as corny, but it’s bearable while it lasts because of the efforts that Andrew Garfield and Teresa Palmer are offering. It ultimately plays as a detriment to the film, however, given as a good part of it comes off as forced when too much happens right on the spot to a point it’s rushed. I understand already that Gibson wanted to form something more with what made Doss the man whom he is during the war, especially with the religious motivations which thankfully, are never rammed down the viewer’s throats like many films that use faith as a character motive. This romance just barely clicks, however, because it comes out flat to best describe it, and then afterwards just disappears. The moment in which it moves away, however, is where things begin to improve for Hacksaw Ridge for the better. It would already be clear from how we have Doss’s faith coming to pose a challenge for him during the training and within no time, it finds a sense of what it wants to become – a detailing of Doss’s transitioning outside of the safe confinements of his previous life, at least what it first appears to be, and then it comes out to the battlefield and ultimately works for the better. The war sequences are amidst the best directed moments to have come out in all the film, grasping a clear sense of grit that gives Hacksaw Ridge the punch it carries. It was at the point it could already make up for Gibson’s weaknesses with melodramatic romance which bogged down the first section, for it never has an urge to take pride in the graphic nature of its violence. Perhaps not in a Thin Red Line-esque universal manner, but an effort that is still worthy of note for a well-meaning look placed upon it. 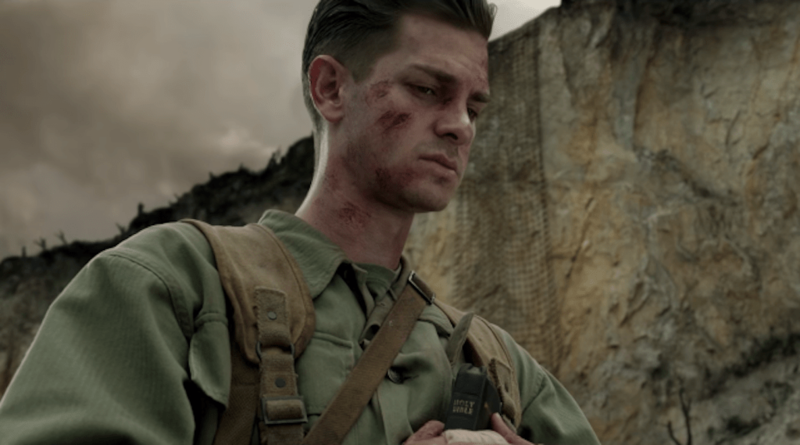 Garfield’s dedication to his role as Desmond Doss is the highlight of Hacksaw Ridge, for a sense of dignity can be found with his fear and his conviction as he moves along with the journey presented for him the whole way through. Hugo Weaving’s portrayal of his father, serving as a crucial part to what forms his character becomes a supporting performance to define the film, together with Rachel Griffiths’s own as Desmond’s mother. That’s not to say all the performances ring perfectly well, for it was difficult to find myself buying into Vince Vaughn during his first moments on the screen, but the moment hits when he comes onto the battlefield and I find myself won over by both him and Sam Worthington’s own contributions. During the right moments, Gibson gets the best of whom he assembles with whoever seems unconvincing during first moments. Perhaps this may be the best war film to have come out in years, but even then it still suffers some rather noticeable schlock that bogs itself down. That said, the efforts placed all throughout even if they never reach their desired level are commendable as they stand – especially the dedication that Andrew Garfield placed into his own role as Desmond. Unapologetic, gritty, and at its core, human, Hacksaw Ridge carries many good intentions and under Gibson’s own eye, delivers itself properly. As a war drama about the humanity on the battlefield bringing out the courage from one’s consciousness, it works effectively. But as a romantic melodrama, it’s hit-and-miss, even if it never feels invasive enough – just a bit pointless. All images via Summit Entertainment.